China Construction America (CCA), owner of Neworld One Bay Street which is the developer of The Pointe, has donated $100,000 to the Hurricane Matthew relief efforts. The presentation was made October 18, 2016 at the opening ceremony of Phase One of The Pointe garage and entertainment centre. 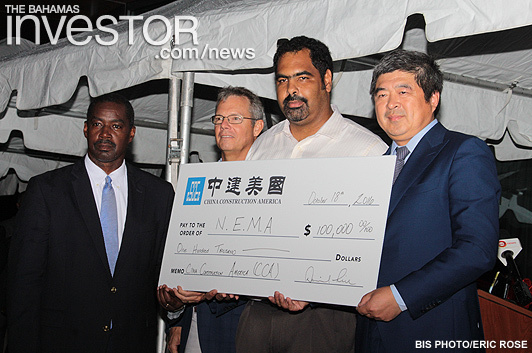 Prime Minister Perry Christie was on hand for the presentation to NEMA. He also spoke at the opening of the facility. The College of The Bahamas has unveiled the designs for a new residential facility to be constructed at the Oakes Field Campus once the college gains university status next month. Bahamian foreign diplomats from all over the world were back in Nassau this week for the third Bahamas Diplomatic Week.